Dear EarthTalk: I saw an article on sugar’s effects on the environment. Has anyone compared different sweeteners (artificial or natural) for their environmental impacts? 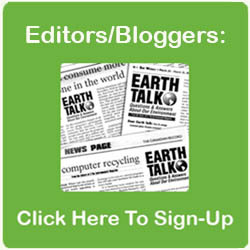 – Terri Oelrich, via e-mail The production of sugar has indeed taken a huge environmental toll. “Sugar has arguably had as great an impact on the environment as any other agricultural commodity,” reports the World Wildlife Fund (WWF), citing biodiversity loss as a result of the “wholesale conversion of habitat on tropical islands and on coastal areas” to grow sugar. WWF adds that the cultivation of sugar has also resulted in considerable soil erosion and degradation and the use of large amounts of chemicals across the tropics and beyond. Some natural food markets now carry sustainably harvested sugar that does not fit this profile, though sugar’s ugly history has led many eco-conscious consumers to look elsewhere to satiate their sweet teeth. Fortunately there are several natural and artificial options that are safe to eat and relatively benign for the environment. Perhaps the most popular choice is stevia, a sustainably harvested herb from Latin America that is 30 times sweeter than table sugar but without calories. Other natural alternatives include coconut palm sugar, barley malt syrup, brown rice syrup, agave nectar, maple syrup and raw honey. These choices may not save on calories like stevia, but they do sweeten without environmental guilt. As for synthetic sugar alternatives, there has been considerable talk of how dangerous they may be for our health, but little evidence of harm has actually come forth and their environmental impacts may be more reason for concern. Aspartame, for example, used in Equal and also in diet sodas, is made by fermenting corn and soy, the two biggest genetically engineered crops in the U.S. Environmentalists are concerned that such tinkering with nature could have unexpected and potentially disastrous results down the road. Another common sugar alternative, sucralose (trade name Splenda) has its issues, too. A study released in 2013 by researchers from the University of North Carolina (UNC) found that the majority of Splenda used around the world ends up in the Gulf Stream, the fast-moving ocean current that starts in the Gulf of Mexico and flows into the Atlantic Ocean and beyond into the coastal waters of Europe and Africa. “Sucralose cannot be effectively broken down by the bacteria in the human digestive tract,” reports UNC. “As a result, the body absorbs little or no calories and 90 percent of the chemical compound leaves the body through human waste and enters sewage systems.” Since this sucralose cannot be broken down by most water treatment systems, it ends up in the oceans, where the long-term effects remain unknown. Saccharin (trade name Sweet’N Low) got a bad rap in the 1970s when rats exposed to large amounts got bladder cancer, but it has since been vindicated: The Food & Drug Administration removed warning labels in 2000 and the Environmental Protection Agency removed it from its lists of hazardous constituents and commercial chemical products in 2010. Nonetheless, saccharin can cause problems for pregnant women and infants who consume large amounts, and also gets a veto as a petroleum derivative. CONTACTS: WWF, www.wwf.org; “Fake sweetener Splenda fills our oceans, scientists find,” www.naturalnews.com/039156_splenda_ocean_pollution_environment.html, “The Sweet Side of Fair Trade,” Green America, www.greenamerica.org/livinggreen/SweetFairTrade.cfm.